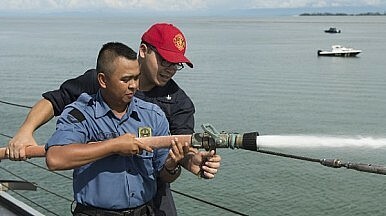 U.S. and Brunei Sailors practice firefighting techniques during Cooperation Afloat Readiness and Training (CARAT) Brunei 2014. The Southeast Asian state could soon be involved in a U.S. partnership program. Brunei and the United States are eying a new defense partnership linking the sultanate’s military with the U.S. national guard, an American has reportedly said. According to Major General Mark Dillon, vice-commander of the U.S. Pacific Air Forces, Brunei has expressed interest in joining the State Partnership Program (SPP), a U.S. program which links a National Guard of one of America’s 50 states with the armed forces or equivalent in a partner country. “We’re working on trying to facilitate that as partnerships are vitally important to us,” Dillon said in a recent briefing at the PACAF Headquarters in Pearl Harbor, Hawaii, according to The Brunei Times. The news comes as Brunei, one of four Southeast Asian claimants in the South China Sea disputes – along with Malaysia, the Philippines, and Vietnam – is struggling to adequately fund its defense needs as its economy suffers with low oil prices (See: “Why Did Brunei Slash Its Defense Budget?”). When unveiling Brunei’s latest defense budget last week, the country’s second finance minister at the Prime Minister’s Office said that amid “austerity measures,” boosting defense diplomacy remained as important as ever (See: “What’s Behind Brunei’s New Defense Budget For 2016?”). The U.S. commander also said that fellow ASEAN member states Malaysia and Laos are also keen to participate, which would further the U.S. military’s goal of boosting its relationships with Southeast Asia. “PACAF are very interested in bolstering our defense ties with the militaries of ASEAN nations. We would like to see our relationship with ASEAN continue to grow,” Dillon said. Currently, the SPP comprises 70 partnerships, with just eight under the U.S. Pacific Command. These include five ASEAN countries – Cambodia, Indonesia, the Philippines, Thailand, and Vietnam – along with Bangladesh, Mongolia, and Tonga. Under the program, the Army National Guard (ARNG) in a state and the partner country engage in regular interactions designed to facilitate greater awareness, capacity-building, and greater interoperability. With the exchanges generally involving the same ARNG personnel annually and the ARNG units being made of individuals from both civilian and military professions, the SPP program is seen as being an important way to foster relationships with regional states and promote U.S. objectives. Some in the United States have long been pushing for the SPP to be expanded in the Asia-Pacific – both privately and increasingly publicly as well. But they have come up against several obstacles, including issues related to program funding, management, and oversight.